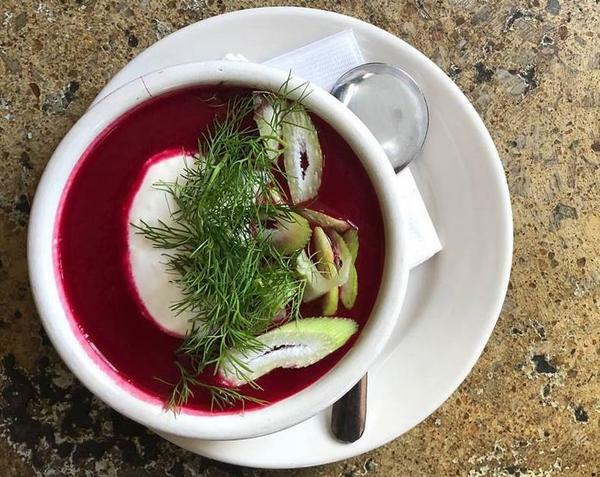 Winter vegetable soup with lemon creme fraiche, fennel and dill at Happy Gillis. Los Alamos Market y Cocina — Pozole soup is served with fresh corn tortillas and fresh cabbage, radishes, limes, cilantro and raw onion go on top of a bright reddish-orange broth whose distinct color comes from the guajillo chiles and tomato. It's filled with pork and hominy, which makes this soup so soul-satisfying when the days get cold. Renovations at Los Alamos have opened up the restaurant to more natural lighting, which doesn't hurt in the winter either. Oregano & Thyme Mediterranean Market – Pumpkin soup, or tomato and rice, or greens in ham broth with potato are among the fine soups at this market right nestled among the other shops and restaurants on Johnson Drive, where Daisy Rodriguez Gavala is making some of the best soups in the city right now. Pay her a visit during lunch for great specials. Thelma’s Kitchen – Shredded potato cheddar soup is simple but delicious, with shredded hash-brown style potatoes instead of chunks. This community cafe is Kansas City’s first donate-what-you-can restaurant, where you can get a full meal — an entree, soup, salad, dessert and a drink — for a suggested donation. If you have no money, you can work for 30 minutes to earn your lunch. Waldo Thai – Tom kha goong is creamy but light, with tons of aromatics: coconut milk, galangal, lemongrass, kaffir lime leaves, onion, fresh mushrooms, cilantro, scallions and shrimp. I would take a bath in this soup. KC Pinoy – Sinigang, or Filipino stew, comes with your choice of pork or shrimp in a sweet and sour tamarind broth with okra, daikon radish and long beans, served with garlic fried rice. Shio Ramen Shop – Khao soi-men is made with chicken broth, coconut curry, chicken, pickled cabbage, scallions, fried noodles, lime, and chili oil. Happy Gillis – The soup selection at Happy Gillis changes all the time, so order whatever co-owner Abbey-Jo Eans has on special. Carrot, squash, or vegetable soups are tasty options. The Rieger – Pork soup is a staple on the menu and one of the few things that hasn’t rotated off of it since the restaurant opened. I think of it as French onion soup meets pork confit: rich and decadent. Port Fonda – Here you'll find an incredible pozole verde. Pork shoulder soaks in a spicy tomatillo-poblano broth in this Mexican stew characterized by its inclusion of hominy. Hogshead KC – Hogshead stew, also known as Brunswick stew, is a Carolinian specialty. Thick and hot, each bite is packed with pork cheeks, corn and potatoes, with smoked tomatoes bringing out the robust flavor. It’s spicy and delicious. Extra Virgin – It might not be the first place you think of for French onion soup, but Extra Virgin’s rich beef broth of caramelized onions under a blanket of cheese is worthy of some love. Columbus Park Ramen Shop – Kimchi ramen with chicken broth and dashi seasoned with kimchi is my favorite, but this ramen shop also has Chinese-style pork sausage, house kimchi, marinated Campo Lindo egg, scallions, and house furikake. Any bowl of ramen co-owner Josh Eans whips up is worthy of attention. Woodyard Bar-B-Que – Chili topped with burnt ends here has received a lot of buzz which is well warranted. Danny Edward’s BBQ – Authentic Mexican chili is available on a seasonal basis. Instead of the typical beef, it's filled with tender pork. Novel – I always order the velvety corn soup on their summer menu. And the butternut squash soup currently on the menu is a more complex version than you typically see, with amaretto cream, truffle peel, and candied black walnuts. Jax Fish House & Oyster Bar – I love the chicken and crawfish gumbo, with andouille sausage, red and green peppers, long grain rice and preserved okra. It’s hearty and satisfying. Niecie’s Restaurant – Homemade beef stew: This traditional classic features long-braised beef, vegetables and potatoes served with corn muffins. It's an old-fashioned-style soup that tastes like someone's grandmother let it simmer all day. Broadway Deli – Matzo ball soup, a regular menu item, is satisfying if you’re feeling a bit wan. The matzo balls are as big as cannonballs but still light and fluffy with a touch of dill. D’Bronx – All locations serve a matzo ball soup with curative powers. Tasty Thai – Tom yum gai is the most restorative soup ever. I need ginger and cilantro when I don't feel well and this soup has it in luscious amounts. Chris Young is an associate producer for KCUR's Central Standard. Reach out to him at chrisy@kcur.org.